True Strike is permanent part of my palette. I use it in all my scores. ProjectSAM’s acclaimed True Strike series holds the original percussion libraries of choice for film, tv and game composers requiring cinematic, powerful percussion samples. 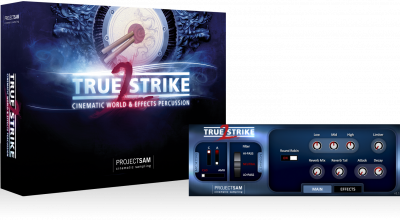 This re-released version of True Strike has been completely re-designed for the Kontakt format and comes with Native Instruments Kontakt Player. 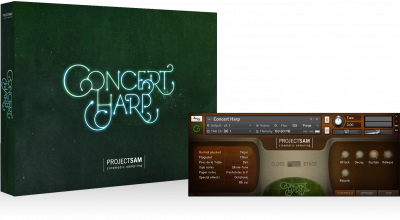 New features include a re-structured instrument list, a streamlined audio pool, real-time microphone mixing other switchable options. 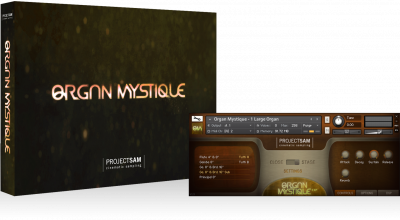 The timpani is one of the biggest instrument banks found in True Strike. You will find an extensive list of playing techniques: up to 6 dynamics, sustained and dampened notes, tremolo, tremolo crescendo in three lengths, crescendo-decrescendo and hard mallet fortissimo. Suspenseful special effects such as pedal bends and cymbal/bowl on timpani. True Strike is aimed at cinematic use. 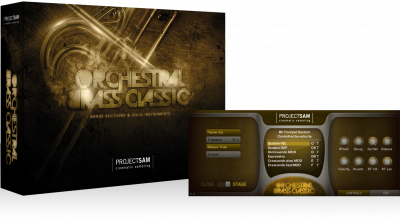 Therefore the gran casa and snare ensemble are the most powerful and deep recordings you will find. Load up the stage or far microphone set and scare those aliens back to their homeworld. The library also includes single snare drum (snares on and off), military drum and field drum samples. True Strike offers an extensive set of small percussion instruments, among which 4 woodblocks, 5 temple blocks, whip, bar chimes, bell tree, 4 cowbells, triangle, tambourine, castanets and sleigh bells. 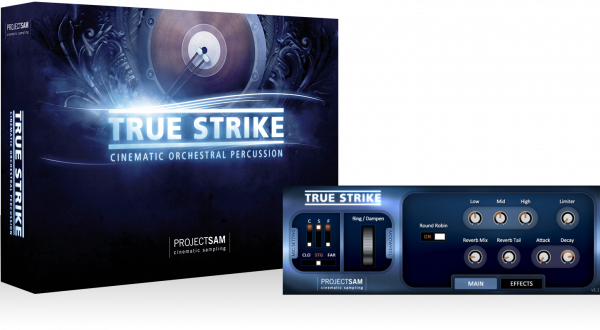 True Strike possesses unmatched musicality and realism. You can sense the presence of the player behind the instrument - not just the instrument itself. I have been using True Strike 1 & 2 for virtually every project I've worked on over the past years. Quite simply, the are the best!